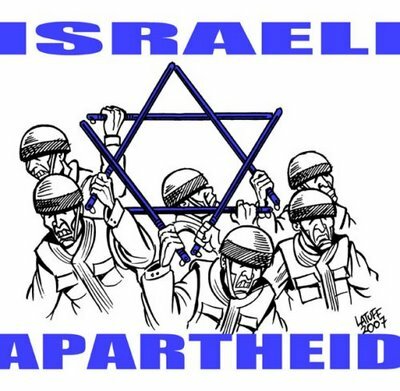 A recent poll published by the Israeli media outlet Ha’aretz indicates what many already know: a majority of Israelis support “apartheid” against Palestinians. Sixty-nine percent of Israeli Jews questioned said they would object to giving voting rights to Palestinians if the West Bank is annexed. Seventy-four percent of respondents favor separate roads for Israelis and Palestinians, and 58 percent believe some form of “apartheid” is practiced against Palestinians in Israel. Around half of Israelis questioned favor legal discrimination against those from whom they stole the land on which their country rests. While some find these numbers shocking and others have questioned their veracity, they seem in lockstep with Israeli policy against Palestinians. There is, after all, no significant or discernible Israeli civil rights movement in favor of full democratic inclusion of Palestinians into the existing framework of Israeli society, a ‘one-state solution,’ or a return to pre-annexation borders. Thus we can only conclude that a majority of Israelis do in fact either passively or actively support the exclusion, oppression, and dispossession of Palestinians by Israelis. Racism and chauvinism do not drop out of the sky. Ideas themselves have no weight beyond the degree to which they reflect and impact actual social relations. Anti-Palestinian attitudes on the part of Israelis are inseparably from the much larger picture of oppression of Palestinians by Israel. It is also notably that Israel is a social-fascist country. That is, several aspects of its economy are socialized or regulated in favor of the popular classes of Israel. Israelis receive public education, universal health care, have access to welfare benefits and public housing, etc. This sounds a like a laundry list of demands by any number of First Worldist leftists, but it all comes within the the context of dispossession, oppression, and exclusion of Palestinians. Israel does have nominally ‘leftist’ social movements. September of 2011 saw hundreds of thousands come out in favor of even higher standards of living of Israelis. Little was mentioned regarding the wholesale oppression of Palestinians. What does this demonstrate? That the demand for domestic reforms in imperialist and imperialist-sponsored countries are themselves often social-fascist. ‘Left-wing’ politics which merely amount to milquetoast demands for wages increases, for example, are not progressive. In many regards, they are reactionary. Attaining lower living expenses and higher wages for Israelis is in large part antithetical to the struggle for Palestinian liberation. The same applies to the US. Obama ending ‘Don’t Ask Don’t Tell’ does nothing to end imperialism, but it does a lot to maintain Amerikans’ support for it; and struggling to raise the wages for (typically overpaid and unproductive) Amerikan workers can only work to unite them in distinction from and exclusion of (typically much lower paid and productive) Third World workers. Israel can tell us a lot. About the bankruptcy of First Worldism and chauvinism dressed up as socialism, about the social-fascist nature of many pro-First World ‘leftists’ today, and about how imperialism transforms whole nations into oppressors or oppressed. It teaches us that socialism or democracy for the few at the direct expense of the many is a form of fascism. It was not for nothing that 20th century German fascists led by Hitler called themselves National Socialists. Real revolutionary politics is about internationalism of the oppressed against the capitalist-imperialist system, not uplifting the few on the backs of many while retaining and exaggerating wider structures of imperialist and national oppression. The United States and Israel are chauvinistic global menaces. Very little in the way of revolutionary socialist and democratic solutions will generate from nominal class struggles from within these societies. Instead, the united struggles of oppressed peoples can end their reign of terror and unlock the possibility of building a world based on equality, democracy, freedom, and sustainability. Next Post Review (Part 2 of 3): Samir Amin, “The Surplus in Monopoly Capitalism and the Imperialist Rent.” Monthly Review. Vol. 64 No. 3. July-August, 2012.